"The little girls in choir robes and pigtails who sang on long ago Sunday mornings grew up to fill concert halls, opera houses, cathedrals and arenas with clarion voices that now enthrall millions. As they once again stand before the choir to sing, it is obvious that, with all its grace, Church claims ownership of their heart of hearts." - Nobel Prizewinner Toni Morrison. According to the Press Release, "Church: Songs of Soul & Inspiration is the first in a series of CDs that embrace the musical roots and role of Church in the lives of today's leading artists. It is a joint venture between UTV Records (a division of Universal Music Enterprises), Tena Clark's DMI Records and Denyce Grave's Carmen Productions." Considering how well-done and inspiring this 2 CD project has turned out, this reviewer can't wait to see the rest of the series! Tena Clark shares that this CD "will be for the Gospel audience and the masses who would never normally buy, or listen to Gospel music. It is not what you would expect from a Gospel record; but the meaning is there, and the love is there, and the grace is there. We made a record about God, about praise, about message, about meaning, about love, which reflects what comes out of your soul. I think this is one God is going to be proud of." The nicely done CD ROM organizes the performers and their songs into three categories; 'That's What Music is Supposed to Do', 'Singing is My Form of Prayer' and 'You Hear God in This Music'. There is a video to see in each category, with the artists grouped according to what they have to say, which ties in nicely to the song each artist performed, or in the case of Dr. Maya Angelou, her wonderful beginning essay, which sets the mood and attitude of the CD right at the beginning, and the ending reprise, where she leads the Fire Choir in an accapella, old time, Gospel church song, summing up a basic truth about the Lord, and how we need to step out in His Word. 1). Dr. Maya Angelou is a Christian lady of many talents, being a well-known, very gifted author, poet, college professor in North Carolina, who is quite capable of expressing her faith in song as well. In her interview, found on the CD ROM that comes with the music CD, She explains the importance and purpose of Gospel music. She says that the Lord gives us art to help us to lift up our hearts, to stand up, by putting starch in our backbone, lifting us to a place where we are able to forgive somebody and make us a little kinder to the next human being we see; that is what Gospel music is supposed to do. Gospel music not only illuminates the beauty of the Afro-American church, but can inspire other people of not only the Christian faith, but other faiths to look at their own values and understand that human beings are more a like than different, as we are all part of the human family, loved by our Creator. 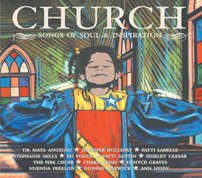 A) The opening selection of this fine CD, begins fittingly with Dr. Angelou's lovely, expressive reading of her essay, IT'S SACRED: CHURCH, where she eloquently explains her understanding of the connection between God, Church, personal spirituality and Gospel music, which is a great introduction to the songs which follow. There is something special about an author reading his /her writings, especially such a gifted, spiritual person as Dr. Maya Angelou. Church is where I want to go when I want a certain fulfillment and church is where I don't have to go, because it is always with me, holding me up, propelling me forward, sustaining me. ..................I am reminded that everything in God's world is sacred. B) * * The ending song of the CD, entitled REPRISE, fittingly sums up the conclusion, with Dr. Angelou singing a short, traditional, rhythmic Gospel song, affirming the importance of trusting the Lord in our lives, and step out in Christian faith on the Lord's promises and love. She sings all by herself with no accompaniment the first verse, and the Fire Choir joins her for a repeat, clapping and stomping the beat, singing accapella. This is a rousing way to celebrate the good news of Jesus, through the wonderful Gospel music genre, as the song builds in harmonies, enthusiasm, spirit and sound level, catching the faith, spirit -filled group performance of the Fire Choir. You said call on My name, and I'm calling, You said trust on my Word, and I'm trusting, You said lean on your arm and I'm leaning, steppin' out on your word. You said You would be my protection, Honor and glory, my Savior, Beautiful Rose of Sharon, steppin' out on your word. 2) Jennifer Holiday - Though blessed with many successes in her career as a modern R&B singer, being a two-time Grammy Award-winner and Broadway star in Dreamgirls, which earned her a Tony, Jennifer shares that she has had greater downs than ups in her life. She has found that through Gospel music and God's love for her, which is greater than her love for herself, she has been able to move forward through the storms to the other side. She explains that singing with Gospel choirs is like having angels behind her, always for her the most powerful moment she can experience. * * * THE WONDER OF YOU - By Baker Knight; 1958 - Originally an Elvis hit. When no one else can understand me. When everything I do is wrong. You give me hope and consolation. You give me strength to carry on. And you're always there to lend a hand in everything I do. And when you smile the world is brighter. You touch my hand and I'm a queen. Your kiss to me is worth a fortune. Your love for me is everything. I'll guess I'll never know the reason, why You love me like you do. That's the wonder, the wonder of You. 3) Patti Labelle - Shares what Gospel music does for her. She first started singing in church at age nine. At first, she was terrified to sing in front of the congregation, but when doing so she felt lifted by God, and felt special, as her singing brought her out of her shyness to a different level of being. She is always feeling church music, as she has a big voice. Church never left her being, and came out in her music, staying with her as she went on to much success in secular music, R&B pop, winning quite a few awards. "Through more than 30 years in show business, Patti has won just about every honor and award than can be bestowed upon an entertainer:"
Way Up There," was the NASA theme song written originally to celebrate the Wright Brothers centennial, which also served as a memorial to space flight and the shuttle Columbia's astronauts. Patti Labelle first performed this song during a Feb. 6 memorial service at Washington National Cathedral for the fallen astronauts, who died in the Columbia shuttle disaster. Her Gospel version of this song on this CD is an uplifting experience, as her spirit, soul and energy dynamically pour into her beautiful, hymn-like rendition, backed up and complemented by the full-voiced soulful Fire Choir. Patti puts her rather impressive vocal range to good use. The piano, organ, drums choir and Patti all meld together in one Spirit to breathe life into this song in true Gospel music style. Dynamics build effectively through the performance which adds to the dramatic effect on one's emotions and involvement with the song, especially during 2nd Chorus. A favorite of this reviewer. Chorus 1: (Patti Labelle and piano accompaniment, with organ accents) Way up there, Where peace remains, Where silence thunders And angels sing. Imagination and amazing grace. Bring us closer to that perfect place. * Chorus 2: (Patti and the Fire Choir) That way up there Peace remains, Silence thunders, And angels sing, Imagination and amazing grace. Bring us closer to that perfect place. 4) Nnema Freelon - Shares that she had a wonderful, warm church experience, where she learned to love to sing Gospel music. "There is such strength from coming together on Sunday morning, pooling collective energies to blend voices in praise and worship of the Lord, which lifts you up out of the hard realities of every day lives" in a secular society. Nnema goes to church with the expectation of being lifted up, transformed. She came hungry for that, and is / was "always fed, being moved where I was to some other place." It is important to come together with the faith and expectation that spiritual needs will be fed, and they will be. "You have not, because you ask not." OOH CHILD - Written by Stan Vincent. - Originally sung by The Five Stairsteps. A song about having faith that hard times will pass. Though released in the secular music market in 1970, it can reflect a personal faith that the Lord will see a person through any trial, trouble or painful circumstance. Someday, yeah We'll put it together and we'll get it all done. Someday, When your head is much lighter. Some day, yeah We'll walk in the rays of a beautiful sun. Someday When the world is much brighter. Right now You just wait and see how things are gonna be Right now. 5) Dionne Warwick - The daughter of a Christian minister, Dionne grew up singing Gospel music, and has a strong belief in the Bible, God and the healing powers of prayer. She defines Gospel music as "praising God and singing the written Word in the form of song, which carries the message of what God wants us to hear." Gospel music has healing power, if you believe in prayer. WHAT THE WORLD NEEDS NOW IS LOVE - By Hal David and Burt Bacharach- Dionne Warrick's original hit. Lovely rendition done Gospel style, Dionne and the Gospel Fire Choir. Strong melody, in 3/4 meter. Chorus: What the world needs now, Is love, sweet love. It's the only thing that there's just too little of. What the world needs now, Is love, sweet love. No, not just for some But for everyone. Lord, we don't need another mountain. There are mountains and hillsides enough to climb. There are oceans and rivers enough to last, 'til the end of time. Chorus. Lord, we don't know another meadow. There are cornfields and wheat fields enough to grow. There are sunbeams and moonbeams enough to shine. Oh, listen Lord, if you want to know. 1) Stephanie Mills - "Growing up in the church and doing things for the church has always been a first for me. I'm the best I can be when I'm singing." Stephanie Mills feels very strongly about the healing power of Gospel music, having observed this healing in others and in her own life. She observes that Gospel music, especially for black people can be the only thing that can heal. She shares that it was Gospel music and her faith in God that sustained her and gave her the power to endure some very painful storms in her life, and offers this advice. "If you know you have the faith to go on, and listen to music, like Gospel music, it has healing qualities that slowly heals you every day, enabling you to get through it." Her '94 Gospel Album was her musical thank you to God for helping her to endure the trials in her life. A nice melody, set in 3/4 time, sung with feeling and soul by Stephanie, backed up with Gospel harmonies, sweetly sung by the Fire Choir. B) Try a little kindness, you'll see It's something that comes very naturally. We can change things if we start giving. 2) En Vogue; Terry Ellis and Cindy Herron. Terry Ellis shares her first experience in singing the main vocal and leading her church choir in a song, "I'm Goin' Up Yonder." As a young person, she joined the choir, and always sat in the back, terrified that the director would ask her to lead the choir in a song. Sure enough, one day the director asked her to come down to the front, and was drafted to sing and lead. During the church service, she started out ok, but got stage fright, forgot the words and began to cry. She must of had a loving, supportive church family, who picked her up out of her embarrassment, who comforted her, encouraged her, bolstered her confidence, because she stayed in choir, continued in her singing for God, which influenced the kind of music she and Cindy Herron sing for their audiences. They choose songs that they can relate to, and write songs from their own experiences, to be positive influences with positive messages, making singing their form of prayer. Chorus: How deep is your love, how deep is your love, I really mean to learn. "Cause we're living in a world of fools. Breaking us down when they all should let us be. We belong to you and me. 2) I believe in you. You know the door to my very soul. You're the light in my deepest, darkest hour. You're my (S)savior when I fall. And you may not think I care for you. When you know down inside that I really do. And it's me you need to show Chorus. 3) Denyce Graves - She was the executive producer of this important project, as well as adding a wonderful vocal contribution to this unique CD. She is known worldwide as a mezzo soprano, singing in Opera Houses and Concert Halls all over the world. Her well- known, signatures roles are Carmen and Samson et Dalila. "The combination of her expressive, rich vocalism, elegant stage presence and exciting theatrical abilities allows her to pursue a wide breadth of operatic portrayals as well as delight audiences in concert and recital appearances." She is known for her classical renditions in Opera, and other forms of traditional music:Spirituals, American, and Christmas carols. Her musical career however began in her church, where the love of Gospel music was imbedded in her being. She shares that she grew up in a deeply religious Christian family. She was strongly encouraged by her mother to sing in church at an early age, being told that "because God kissed your throat, you should use your voice to the glory of God." Denyce feels that performing is one pure most beautiful thing that she has been blessed with in her life, and to her, is a form of praying. "I'm the best I can be; the most loving, most compassionate, and the closest to God when I'm sing." With this special project, she feels that she has come full circle. She started her journey in music by praising the Lord through Gospel music in church, then branched out to Opera and other classical music, but returned once again to her Gospel roots by producing this CD, with Tena Clark. * * * AVA MARIA - This composition was written by Giulio Caccini, and was published in a collection of songs called Le Nuove Musiche (The New Music), in 1601, and was quite different from the later and more popular Schubert and Bach / Gounod versions. For this CD entry, Tim Heinz, David Perry, Denyce Graves and Carmen Twillie collaborated together, taking the beautiful melody and modern harmonies of Caccini's piece, blending them into a Gospel style rendition, creating a new version of Caccini's music. The result is simply heavenly, guaranteed to float you off the ground and around the room. Denyce flawlessly, reverently sings this prayer hymn, doing justice to the lovely melody with such feeling, as her voice "kissed by God" takes you into the spirit of worship and reflection - definitely a highlight for this reviewer.
. As you can see, she is another great, accomplished singer who got her musical start in church on the south side of Chicago. She shares that singing is her form of prayer, as the Spirit of God come through and moves through her as she sings. Singing is how she prays best. Chaka Khan also steps out in her faith by supporting women and children in crisis as her way of giving back a portion of what she has been blessed with; musical talent, a love of children, a big heart and a love for the Lord. Chaka simply says, "It's time to build up and time to give back."
. * *LOVE ME STILL - The song takes place between two people, who have a close relationship, perhaps a parent and young person, or a mentor and his /her student, or a couple. One has strayed away, but found out the hard way how valuable the love of the other person is in their life. On the spiritual level, it could also be a person who has strayed away from the Lord, but returned, and asking Him if He can forgive and if He still loves this person. Chaka Khan and the Fire Choir bring the song to life, creating a most enjoyable rendition of this sparkling arrangement. Verse 1: Here is my hand for you to hold. Here's the part of me they not sold. I've wandered far, I've had my fill. I need you now, do you love me still. Only you have seen the hidden part of me. Call me fool-hearted, if you will. I loved you, and do you love me still? Only you have seen the hidden part of me. Call me fool-hearted, if you will. I loved you, and do you love me still? Patti Austin - She shares that she grew up in the Abyssinian Baptist Church in Harlem, where she fell in love with Gospel music, after hearing it for the first time, being impressed with the Clara Ward Singers and the Blind boys of Alabama. She looked forward to coming on Sunday. Her talent emerged early. Not only did she sing in church, she also sang at the Apollo Theater at the age of 4! She has had a distinguished career in jazz, pop, and rhythm and blues. Singing is also a form of prayer for her. Patti finds music to be a catharsis that can unlock bottled up emotions and parts of our selves that we must "bridle" in our society at large. She says, "Music unlocks all that, so you can feel whatever is coming at you, and you respond to it." She looks for songs that reflect positive growth and learning, that bolster the strengths of people, rather than their weaknesses. The song, You Gotta Be is a great example, as it gives great advice on developing a positive attitude toward life; to step out in faith, courage and not be defeated by fear, self-doubt, negativity, bad relationships. * * * YOU GOTTA BE - By Des'ree Weekes and Ashley Ingram (1994) - This upbeat version is one of this reviewer's favorite songs. Effective use of dynamics in both the vocals and instrumentation. Great vocal accents by the choir throughout. Patti's strong voice and ability to catch the mood of the song in its various dynamic stages makes this song both enjoyable and interesting to listen to, as its positive message will put one into a positive frame of mind. Verse 1: Listen as your days unfold. Challenge what the future holds. Try and keep your head up to the sky. Lovers, they may cause you tears. Go ahead, release your fears. Stand up and be counted. Don't be ashamed to cry. Chorus: You gotta be, you gotta be bad, you gotta be bold, you gotta be wiser, You gotta be hard, you gotta be tough, you gotta be stronger. You gotta be cool, you gotta be calm, you gotta stay together. All I know, all I know, love will save the day. Herald what your mother said. Readin' the books your father read. Tryin' to solve the puzzles in your own sweet time. Some may have more cash than you. Others take a different view. My, oh my, hey ay. Pastor Shirley Caesar - Started singing for the Lord at the tender age of 10 in her hometown church located in Durham, North Carolina. During her many years of service of providing music, ministry and message, she has earned many Grammys for Best Traditional Soul Gospel Album , Best Soul Gospel Performance, as well as many Stellar Awards and Hand Dove awards. Besides bringing the Gospel to the world through her music, Shirley Caesar also pastors her own congregation, Mount Calvary Word Of Faith Holy Church Raleigh, North Carolina. She shares on the CD ROM that "singin' and preachin' go together like ham & eggs." Throughout her years of music ministry, she found that while singing, she had to preach a little. Thus it was difficult to sing, and not preach a little. It was a natural transition, from singing evangelist to pastor. In her music, she likes to blend contemporary Gospel music with traditional Gospel music, in order to reach a wide audience of people. Her goal is "to reach back, take contemporary and add it to traditional, in order to reach mothers, young people and everybody." Verse 1: Why should I feel discouraged? Why should the shadows come? Why should my heart feel lonely, And long for heaven and home. When Jesus is my portion. A constant friend is He, His eye is on the sparrow, And I know he watches over me. His eye is on the sparrow, And I know he watches over me. Chorus: I sing because I'm happy. I sing because I'm free. His eye is on the sparrow, And I know he watches over me. Anne Nesby - Ann Nesby grew up in Joliet, Illinois, the daughter of two musical parents. Her father sang in a quartet, and her mother sang in a Gospel group. She was surrounded by music at an early age, as both musical groups rehearsed in their home. Her musical talent emerged early. She sang at the age of 3 at the Mount Zion Baptist Church. At the age of 5, she was the youngest member of a church singing group which performed at a Baptist Convention in Chicago. Her mother helped her develop her vocal skills as she matured. She made a musical splash as the lead vocalist for the 30 member Gospel choir, The Sounds of Blackness, under the direction of Gregory Hines. She started her solo career in 1996, and started her own label, It's Time Child Records. A beautiful song, written in a minor key, starts off with an expressive, soft piano introduction. Ann Nesby sings the beautiful melody and words expressively, supported by chords in piano and organ. Nice soulful, soft electrical guitar solo, with organ. Fire Choir offers accent support in for the third verse.